When beautiful young women begin to vanish from Boston Logan International Airport, State Police Lt. Hannah Summers is the only one who sees a pattern amidst the cold case files. 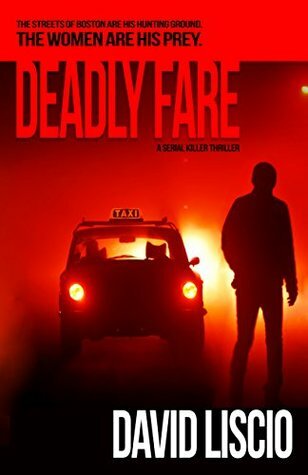 She knows a killer is on the loose, and she’s determined to make her chauvinistic bosses believe her hunch about a gypsy cab driver — before it’s too late. As the body count rises, so does the public’s panic. Under pressure from the district attorney to make the killings stop, Summers soon finds herself rubbing elbows with ex-Special Forces soldier Emmett Decker, a private investigator hired by the wealthy family of a missing local girl. The more their paths cross, the harder it is to deny they may be chasing the same monster — and that the tension between them is more than purely professional. Fans of James Patterson and Harlan Coben won’t want to miss this page-turning thriller set in Boston. Well this is an outstanding novel in its own right but when I realised that this is David Liscio’s debut novel then it moved into absolutely stunning. This is a gripping story where the author took me inside the head of this serial killer, that has such a terrifying hatred for women, so much that when I finished reading I felt like I had brought him back into my own mind. It isn’t a secret who the killer is, which made it more intense, I was reading knowing already his plan for each victim and each time, even reading it made me pull back as if I could avoid him. I didn’t get goose bumps, it was more like there was something under my skin, that crawling tingling feeling when something repulses you, that is how good the writing is. Luddy, the serial killer, has the perfect job for picking up young women, a job where people assume he is a good guy. He is so brutal that these poor women are more like rag dolls but when Detective Lt. Hannah Summers pieces together the connection between them all, it is dismissed. She just can’t let it go and neither can Reporter Rane Bryson, who is regularly poking a stick at this hornets nest. Then it isn’t long before Emmett Decker, an Ex Special Forces soldier, is hired by a wealthy local family to track down their missing daughter and things really heat up. The scene is set. The back stories to the characters were brilliant giving them substance, especially Luddy and his mother Celeste. It really does back up that old saying ‘son of a b****’, because she certainly is! They say write about things you know and that is just what he has done, being set in Boston, with his personal knowledge of sailing and himself being a photojournalist and an investigative reporter it is a beautifully written, with tremendous confidence. A highly recommended book. DAVID LISCIO is an international, award-winning photojournalist whose lengthy experience covering crime stories led to the writing of the serial killer thriller Deadly Fare. An investigative reporter, David’s work has appeared in dozens of magazines and newspapers. The recipient of more than 20 journalism honors, his feature stories have earned first-place awards from the Associated Press, United Press International and many regional news media groups. He has reported extensively on organized crime in both the United States and abroad, in addition to writing about environmental and military subjects. David is an avid sailor, outdoorsman and adjunct college professor. A father of two, he lives with his wife and dog on the Massachusetts coast, where he is a volunteer firefighter and Ocean Rescue team member. He’s currently at work on another novel.